First Light at Emerald Bay, Lake Tahoe. 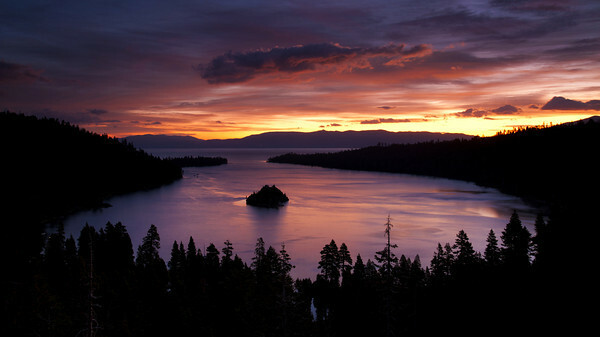 I have taken many early light images at Emerald Bay for the past few years. With at least 20 attempts under my belt with little success. Well... I have witnessed some nice light but I'm always looking for drama in the sky. It is not as easy as one might think to capture all of the elements coming together. Gap light, clouds and color throughout the sky and in the water. When I visit Lake Tahoe, I'm up at 4:30 am and work my way down to a pull out along Hwy 89 at the back of Emerald Bay. You just never know what show nature will put on so you must go there and be ready. Emerald Bay is a must see when you are in Tahoe, whether you drive along hwy 89 or you take one of the many cruises that venture into the emerald blue water. This image was captured on September 25, 2011 at 6:27 am. This is a 13 second exposure, f9, ISO 400 at 29mm. this helps balance the light and create a more pleasing exposure.